Hi! I’m Amy, design director at Libeco Home. In my designer notes, I would like to take you with me, tell you more about my inspiration and how this summer collection came together. the southern bight of the North Sea bounded by the coasts of the Netherlands, Belgium, France and Great Britain. My inspiration for this collection comes from coastal living. Its name, from the Southern Bight of the North Sea. Coastal living immediately brings up visions of blue and white and a casual lifestyle that lends itself perfectly to linen. We had the pleasure of photographing in a beautiful house on the Belgian coast with a model named Charlotte who makes everything look and feel relaxed and calm, which is exactly what I wanted. a bend or curve in the shore of a sea or river. a body of water bounded by such a bend. I am definitely a beach person, not much of a mountain person, so designing beach inspired textiles is totally my thing. I draw loads of inspiration from beach destinations close to us – southern Spain, Corsica, Sardinia- where there’s color, but it’s always washed out, never intense. Another important piece of the inspiration puzzle this year was DENIM. I have a major thing for denim, I always have. My favorite denim of all time is vintage Levi’s – the older the denim, the more washed out, the better. 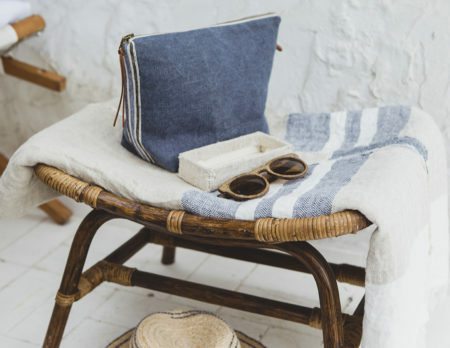 The denim feeling in this collection is really strong in the Galloper accessories, and also the Folkestone bed linen – washed linen, with a bit of a worn-in, wrinkled look. For the bedrooms I would choose a duvet from one collection and mix the pillows from a few different collections. For table linen, definitely one table cloth with napkins from one or two different collections. 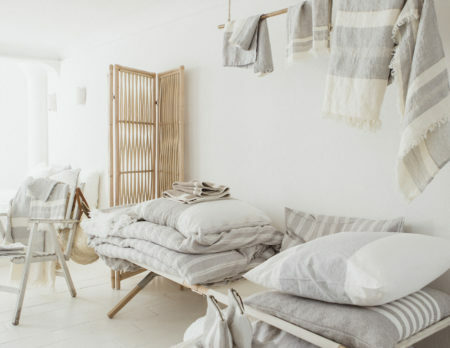 I would definitely use Belgian towels in every room, thrown over furniture, to add an interesting element. And personally I would use the new North Sea throw over the end of a bed, because it’s a beautiful piece. Last but not least, the new Galloper bag- because my daily wardrobe is jeans- it’s a must have! Presenting to you the Spring/Summer collection 2019. Our designer Amy explains where she got her inspiration from. She visited the Guest House of Atelier Turquoise in Ghent. New summer collection of 2018 has arrived! 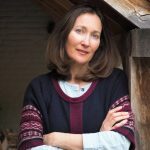 Amy presents to you our latest bed linen, table linen and accessories for you, while explaining where she got her inspiration from this year. La Brugeoise was the inspiration for Amy’s fall/winter collection of 2017. Read about how she found her inspiration for another fantastic collection of Libeco Home.